In this knowledge-based, Information Age, it’s essential that you provide your followers with a steady stream of pertinent content. You may have heard it said that “Content is King” and there’s a reason for that. Content that is interesting, relevant, and valuable encourages people to like and follow you. The more your information is aligned with their interests the more engaged they’ll be. The deeper the conversation, the better positioned you are as a trusted expert in your field and industry. Here are a few helpful tips to prompt you as you prepare your content for your cross-channel communication platforms. Trade Places – Think like your customers. What do you want them to know about you and your products and services so they will take action and engage? Tell Your Story – Passion, goals, and mission can inspire and motivate prospects and clients who want to do business with you. Bio/credentials/certifications. Did You Know? – Keep prospects and clients informed with relevant, pertinent, interesting tips and information. Shout Outs – Recommendations and referrals. By endorsing, promoting, referring and recommending you are creating trust between you and your clients. It gives credibility not only to the person you referred but also to you. Be Real – Write like you talk and draw others to the conversation in a way that encourages them to engage with you, follow you, eventually buy from you and then tell others about you. Testimonials – Let someone else sing your praises and tell others how great you are. Learning Curve – What are you reading, learning, and teaching? Share it with others. Trends, Tips & Technology – What’s new in your industry? Help people stay informed and up to date with the latest and greatest in your business area of expertise. Events – What are you attending or hosting that you’d like to have others join you? Events –Fun Facts & Trivia – Think about facts and trivia that may be related to your industry. Have fun and a sense of humor and people will be more drawn to you. BONUS: Use acronyms, daily tips, themes and categories to make your posts something you followers will look forward to. Stumped? Can’t think of what to write? You can say it first and then write it. Use Dragon or a dictation app on your phone, iPad or computer. You can speak it into print and then edit afterwards. “There are many people who are enthusiastic about their companies or careers, but most don’t have the skill set or team to back up their performance promises. 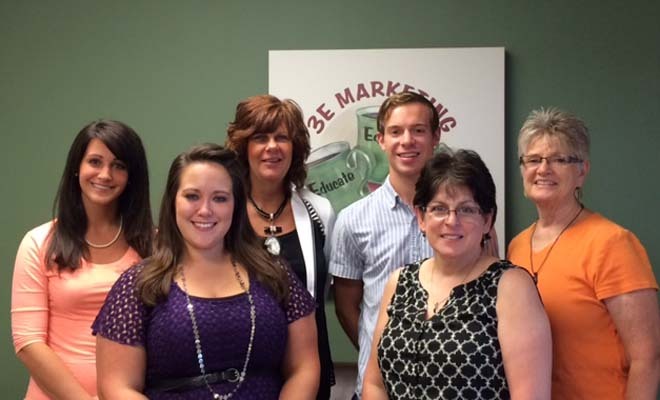 Not so with Donna Duffy and the 3E Marketing Solutions team. Our marketing efforts and website were muddling along before we joined forces with 3E. Donna is truly a dynamic speaker – informative, funny and engaging. I have come away with a helpful tip or two from every workshop I have attended. Since joining forces with 3E, we have gently edged our way into the 21st century, engaging in social media, regular email communication with our current clients and our “not yets”, and modifying our website for better lead capture. Her support team allows me to stay focused on my business while they act on my behalf behind the scenes to make this all happen.